The 2006 Ford Fusion received poor marks in offering motorists' protection in side crashes, according to new crash tests released Sunday by the insurance industry. BMW's redone 3 series and the redesigned Lexus IS finished at the top of the seven mid-sized cars tested, getting good ratings in front and side crashes, and acceptable ratings in side impact tests, reports Jeff Gilbert of CBS Radio station WWJ-AM (audio) in Detroit. the Insurance Institute for Highway Safety's also said a redesign made Hyundai Sonata much safer and the new Pontiac G6 is a vast improvement over its predecessor, the Grand Am. Safety tests can affect sales, but what is most critical is how many lives are saved because of testing and subsequent redesign, reports CBS News correspondent Thalia Assuras. The Fusion, a mid-size sedan starting at $17,795, received Institute's lowest mark on side-impact tests conducted on a model without optional side air bags. 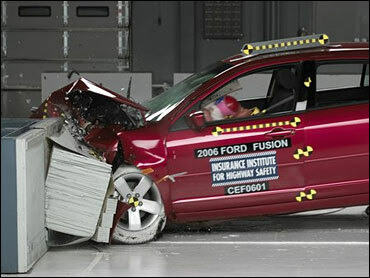 On frontal crash tests, the Fusion received the institute's second-best mark of acceptable. "Nearly every car now earns good ratings in our frontal test," said Adrian Lund, the institute's president. He said the Fusion was not competitive with other cars in its class and was the "lowest-rated moderately priced midsize car we've evaluated." "We're pretty disappointed," John Nolan of the Institute told Assuras. "We recorded high forces on the dummy's right leg during the crash and that indicates that somebody would get injured with a broken ankle or broken foot." The test results also apply to the 2006 Mercury Milan, the Fusion's corporate twin. Ford spokesman Dan Jarvis said side air bags and side curtain bags would be standard on 2007 models built after September. The automaker has requested additional frontal- and side-impact testing for a model with the air-bag option, which costs an additional $595. "We expect it will earn higher side-impact test ratings with that standard equipment," Jarvis said. The institute released new test ratings for eight new or redesigned midsize and luxury cars. The 2006 BMW 3 series and Lexus IS "earned the silver top safety designation," said Institute spokesman Russ Radar. Test results for the 2006 Pontiac G6 showed the importance of having side air bags. A G6 model with optional front and rear curtain air bags and front seat-mounted torso air bags received the second-highest score of acceptable. A G6 version tested without the side air bag package, an option which costs $695, received the lowest mark of poor. Both versions received top scores in frontal tests. Bob Lange, GM's executive director of vehicle structure and safety integration, said the performance of the G6 sedan without side air bags "is competitive with other midsize sedans without side-impact protection." In past testing, a 1999 Grand Am received the lowest mark on frontal tests. Hyundai Sonata models built from 1995-1998 had received a poor in frontal protection and the 1999-2005 models received poor ratings in side crash protection. "Both have had poor ratings in their prior generations and now these new vehicles are significantly improved," said Nolan. Among other newly tested vehicles, the 2006 Acura TSX and Infiniti G35 received the second-highest mark of acceptable in new side tests. Both had received top marks in previous frontal tests. In the institute's frontal-crash test, vehicles strike a barrier on the driver's side at 40 mph. In the side-impact test, vehicles are struck with a barrier moving at 31 mph to reflect the force of a pickup or sport utility vehicle.